Matias Cozzi remembers the moments as if they were sparks of light. The moment he was transported to University of Florida Health. The moment he was told he would need a double lung transplant. The moment his lungs arrived. 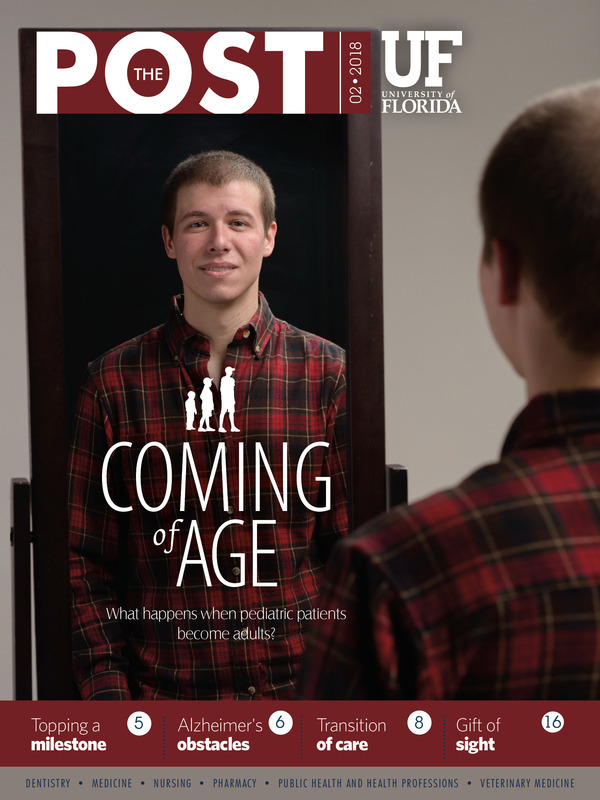 The moments he was saved by UF Health physicians — four times over. In August 2017, Matias started to cough up an unusual amount of blood. The 17-year-old, who has been living with cystic fibrosis, or CF, most of his life, had coughed up blood on occasion. Overall, he managed his CF around the clock through a combination of pills, four nebulizer treatments each day, therapies and an active lifestyle through soccer. However, during the summer, Matias noticed unusual changes in his health. On Aug. 6, his parents, Ed and Andrea Cozzi, took him from their home in Port St. Lucie to St. Mary’s Medical Center in West Palm Beach. Physicians recommended that he be taken to specialists at UF Health Shands Children’s Hospital for further evaluation and to have a minimally invasive procedure to plug the bleeding arteries in his lung. the UF Health Pediatric Lung Transplant program. Tsifansky raised the idea of lung transplantation. The process and preparation for becoming a lung transplant recipient are rigorous. To get on the list, the patient must show adequate physical strength, good nutritional status and emotional determination. Patients need to be sick enough to need a transplant and to be well enough to heal afterward. Matias was admitted to the pediatric intensive care unit, where he underwent a second procedure to stop the bleeding in his lungs. The arteries leading to his left lung became obstructed and collapsed, and doctors quickly removed the obstruction. An hour later, the other lung collapsed. He was so weak that even if he were put on the list, his chances of surviving until transplant — and through the procedure itself — would be low. To make his situation worse, he developed respiratory failure and pneumonia. His lungs were failing and despite a ventilator, they were not capable of keeping him alive. Tsifansky reached out to Tiago Machuca, M.D., Ph.D., a thoracic surgeon and surgical director of the UF Health Pediatric Lung Transplant Program, to see whether Matias would be a candidate for a device serving as an artificial lung machine. It’s called extracorporeal membrane oxygenation, or ECMO, life support that puts oxygen in the blood and takes out carbon dioxide. ECMO was now the only option to keep Matias alive until a transplant. Machuca and his team connected him to the artificial lung. But the pneumonia would continue to worsen, so doctors had a limited window to get Matias stronger and listed for a lung transplant. Slowly, Matias started sitting, walking and gaining weight. But after two weeks, his condition worsened, and he began to bleed from his airways and lungs. Tsifansky and Machuca realized that even with Matias on the ECMO machine, time was running out faster than expected. “By that point, Matias and the family had been through so much and showed such courage, determination and will to survive, that even though we knew his condition was worsening, we decided to place Matias on the transplant list,” Tsifansky said. “What we were able to experience over those two weeks gave us the confidence that, if we were going to push medical and surgical limits, Matias was the perfect candidate,” Machuca said. “I remember that day my dad telling me, ‘You’re on the list, you’re on the list,’” Matias said. Now, a second battle began: the wait for new lungs. Doctors estimated that the ECMO machine would not be able to support him for more than 48 hours. They would challenge him to see if he was determined to have a pair of lungs. “They don’t want to give lungs to a patient who isn’t going to fight for those lungs,” said Andrea Cozzi. Two days after being placed on the wait list, doctors discovered that they had a donor. Time, however, was nearly exhausted. In less than 24 hours, ECMO would stop working. The moment had arrived for Matias to show he could walk and sit on his own. With the help and encouragement of family and multiple team members, one by one, the steps came. He did it. Over the course of Sept. 20 and 21, Machuca and Mauricio Pipkin, M.D., a thoracic surgeon at UF Health, performed a 12-hour lung transplant procedure. Matias’ condition was grave. His blood contained barely enough oxygen to sustain life. The family, including siblings, grandparents and extended family, waited for Matias to receive his new set of lungs. The surgeons arrived at the waiting area to give the family the news. The operation was a success and Matias was stable. For the first three weeks post-transplant, Matias recovered in the pediatric cardiac intensive care unit. He regained his strength nearly a month and a half after the surgery. He was discharged on Nov. 20 and began the rehabilitation process, also at UF Health Shands Hospital. He looks forward now to being a typical teenager.